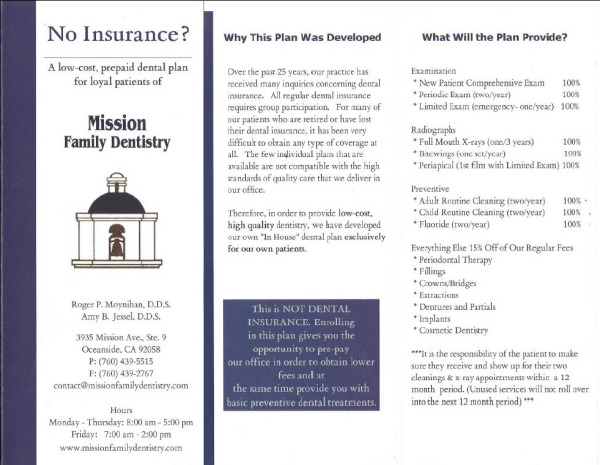 Over the past 25 years, our practice has received many inquiries concerning dental insurance. All regular dental insurance requires group participation. For many of our patients who are retired or have lost their dental insurance, it is very difficult to obtain any kind of coverage at all. The few individual plans that are available are not compatible with the high standards of quality care that we deliver in our office. For this reason, we have developed our own "in-house" dental plan, exclusively for our own patients. 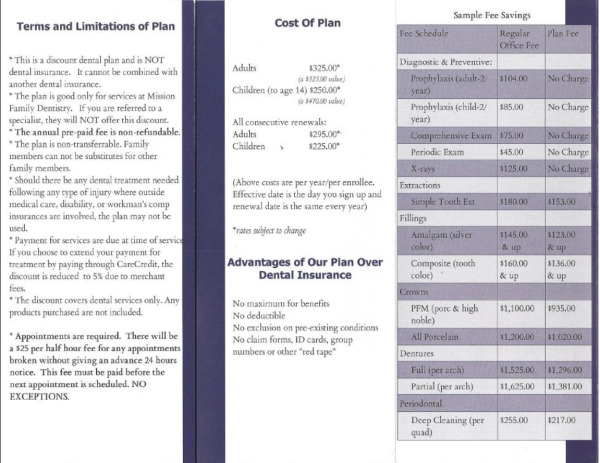 This is NOT dental insurance, so there are no premiums, deductibles, or maximums. Enrolling in this plan gives our patients the opportunity to pre-pay for routine, preventive dental care, and offers a discount for any other necessary dental treatment. We would be happy to explain any questions that you have regarding our in-house, pre-paid dental loyalty plan!